Traveling through the Holy Land has been an interesting experience. I anticipated it would be fairly moving to visit the places that were important in Christ’s life and ministry. However, I had no idea that many churches were actually built over and around these holy sites. On one hand, we’ve discovered certain churches to be over-glamorous and it’s been difficult to summon a spiritual connection. 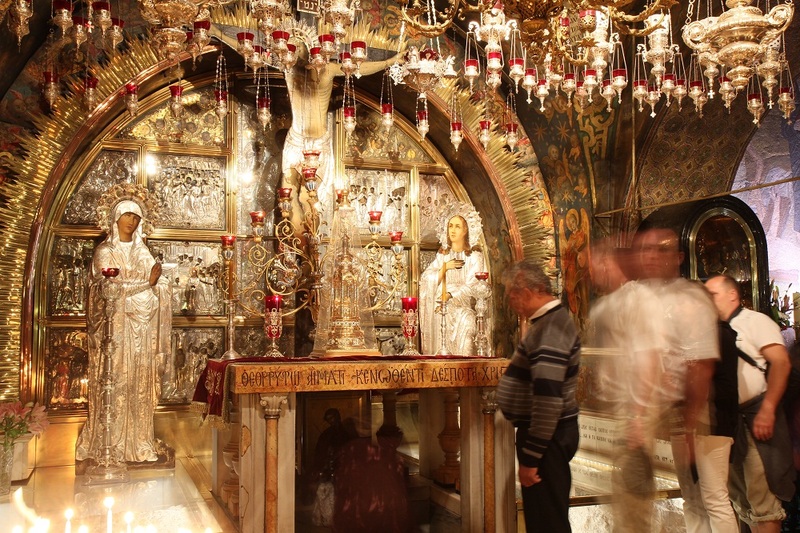 For example, both The Church of the Nativity (Bethlehem) and the Church of the Holy Sepulchre (which was built over the place where Christ was crucified in Jerusalem) are shiny and – in our opinion – gaudy, with lots of hanging lamps (the style of the times). 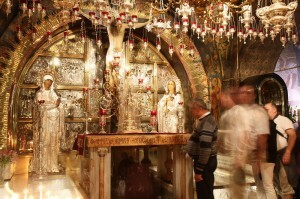 For us, they reflected nothing of the humbleness in which Christ entered and left this world. Not to mention, we were both shocked and entertained to discover that rival priests (Greek Orthodox and Armenian) regularly fight over ownership of these two particular churches. 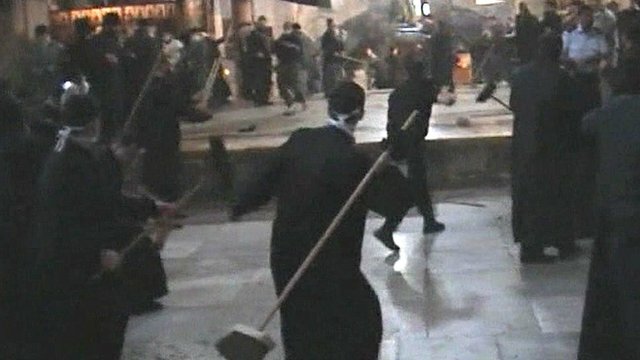 While not great footage, this BBC clip provides a glimpse of the craziness that ensued most recently at the Church of the Nativity: A broom brawl, within feet of the cave where Christ was allegedly born. What are we, five?! But our pilgrimage was thankfully not in vain. It was much easier to stand on the shores of the beautiful Sea of Galilee and imagine Christ walking on the water, calming the storm, and teaching about the beatitudes. There is something about the untouched genuineness of nature that incites a more intimate connection to the divine, certainly more so than any human made church ever could (especially when “men of God” are fighting with broomsticks!). While standing in Shepherd’s Field I was filled with Christmas carols and it was truly meaningful to gaze out across the hills (developed as they now are) and wonder what it must have been like for the shepherds to see the blinding light of the heavenly hosts in the sky. It’s wonderful to have gained a personal visual of these places and reading about Christ’s life in the Bible won’t be as vague and far off as it once was now that we’ve seen this land with our own eyes. Written by: recklesswonder on December 24, 2011.on January 1, 2012.